How do I post an Instagram review on Octoly? Step 3: A window will appear that allows you to input the URL of your Instagram photo. You can find this link by logging into your Instagram account from your desktop. Once this last step has been validated, your review will be linked to the product you ordered and your credit becomes available! You can then order another product of your choice. Please remember you can post a maximum of 5 products for Youtube videos, and 3 for Instagram pictures. Good news! You can now order products on Octoly and post honest and authentic reviews in Instagram Stories. Include the branded product link for your community to purchase directly through your Stories. Pretty cool, right? 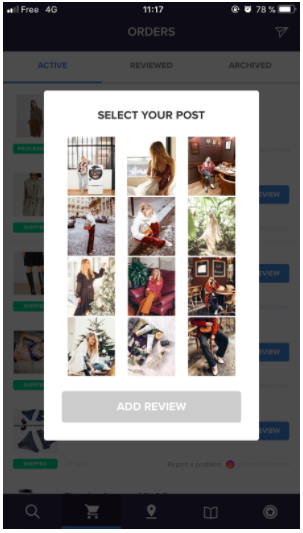 On the Octoly app, in the second tab "My Orders", you can choose your reviews directly by clicking on the reviews (Instagram photos or YouTube videos) that will be displayed when you click on “Add review”. If your review doesn’t appear because it was in a previous post (only your 9 latest posts are displayed), simply post your review from a computer by copy-pasting the link of your review.